The sky’s the limit when it comes to the number of ways you can illuminate your living spaces. But deciding on the proper lighting style and fixture for a particular room should be thought through carefully. Proper lighting can greatly enhance the look, feel, and functionality of a room. Consider the type of space you’re looking to light. A decorative chandelier can serve as a statement piece over the dining room table or in an entryway. Chandeliers, as well as pendants and ceiling or wall-mounted fixtures are all examples of surface-mounted light fixtures. Flexibility is a big perk of surface-mounted lights. They come in all shapes and sizes to complement your space. Surface-mounted lights may be large or small, and hang low, or sit flush to the ceiling. They provide good, quality, lighting and can easily be incorporated into any space. But what about basements or rooms with low ceilings? 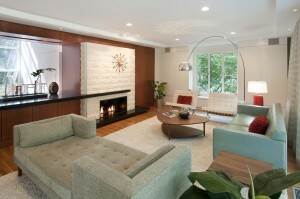 There may not be room for certain surface-mounted fixtures, or they may not jive with the look and feel of the space. And how about underneath cabinets, or above kitchen islands? What if you have a piece of artwork or furniture that you’d like to highlight? These are scenarios where recessed can lighting can be the ideal choice. Recessed lights are installed flush with the ceiling. This can help to make a room feel larger. Recessed lighting provides a clean and minimalistic look and feel. Recessed lighting is often used to cast more light where you need it most. Select fixtures come with the option of gimble rings, which allow them to tilt to a certain degree, and shine on something specific in a room. This makes a wonderful choice for picture lighting. Recessed lighting can also be used throughout an entire space, but it doesn’t provide bright light as a surface mount. Recessed lighting can be a bit more complicated to install, unlike surface-mounted fixtures, which most rooms are equipped to accommodate. Adding either type of lighting is a routine job for your licensed electrician. In some rooms, you may want a range of lighting within a single space to meet your needs. 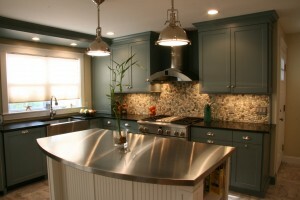 You might want a hanging pendant over the kitchen sink, and recessed cans to shed light under the cabinets. Consider layering your lighting to add to the aesthetic appeal and functionality of a room.